It has "only" been a few months since we landed back home from Portugal. Lisbon is one of my favourite cities. The up and down streets were killing me but at the same time they were very rewarding and charming. Once I am at a new place, I love nothing more than strolling around, falling in love with places and getting inspired and eat good food. In case you’re thinking about taking a trip to Lisbon or want to read my personal thoughts, keep on reading. June was hot and windy, so my choice to wear very light, flowy pieces wasn't always the best idea. One day I wore a light white blouse with my favourite ruffled skirt. I really felt special in this outfit. For the next day, I picked the dress with stripes and open shoulders from Pinko. Perfect choice for a stroll around the city. If you entered the city with the car, I highly recommend driving through the Vasco da Gama Bridge. Even better if you do that before the sunset. Which means the Monument of the Discoveries and celebrates the Portuguese Age of Discovery during the 15th and 16th centuries. 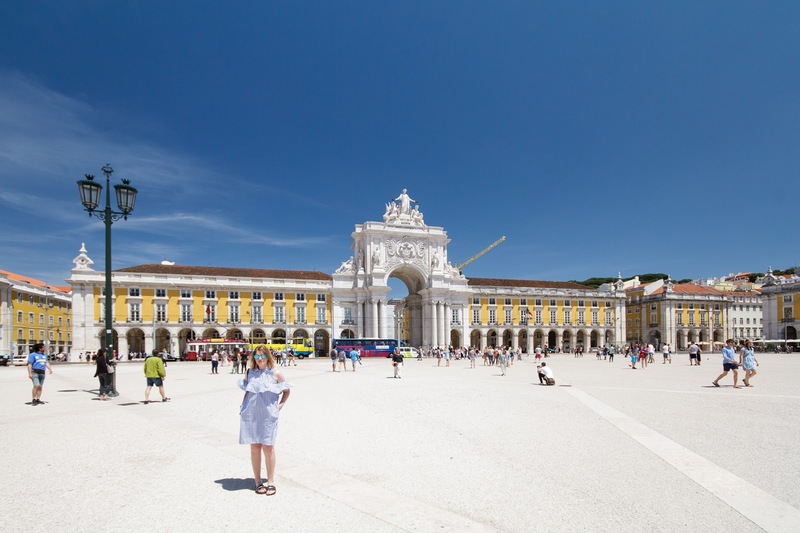 The top of the monument is reached via an elevator or stairs, offers views of the Tagus river with Vasco da Gama Bridge, Christ the King, the Belém neighbourhood, the Belém Tower and the Jerónimos Monastery and the view is stunning and definitely worth getting up early in the morning. The interior consists of halls full of exhibitions. Normally, the auditorium hosts a multimedia exhibition on the history of Lisbon. We visited an exhibition about slavery and racism, which was very informative and blunt. 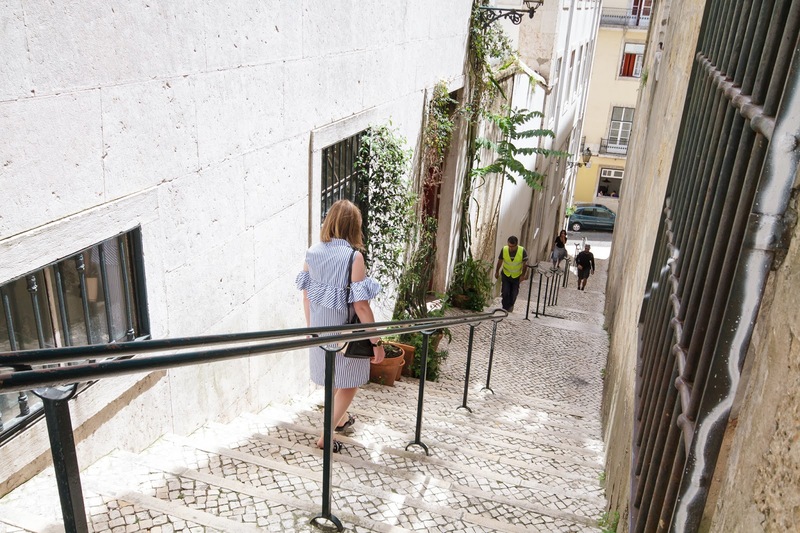 Lisbon's cultural and bohemian heart beats for nightlife and it is a shopping mecca. Sections of streets are quiet during the day but they get transformed at night. You can experience a completely different Lisbon after dark. Throughout the week and especially on weekends you'll find people of all ages, backgrounds and lifestyles bar-hopping through the cobbled lanes or standing outside with a drink in hand enjoying the city's usual mild nights. We have found lovely Airbnb flat which was a very good choice because it was part of one of most genuine Lisbon streets. It is a nice area, mostly on the hill, with a nice view and colourful buildings. It also has a pleasant square and shady garden. Just take a nice walk, enjoy and relax. 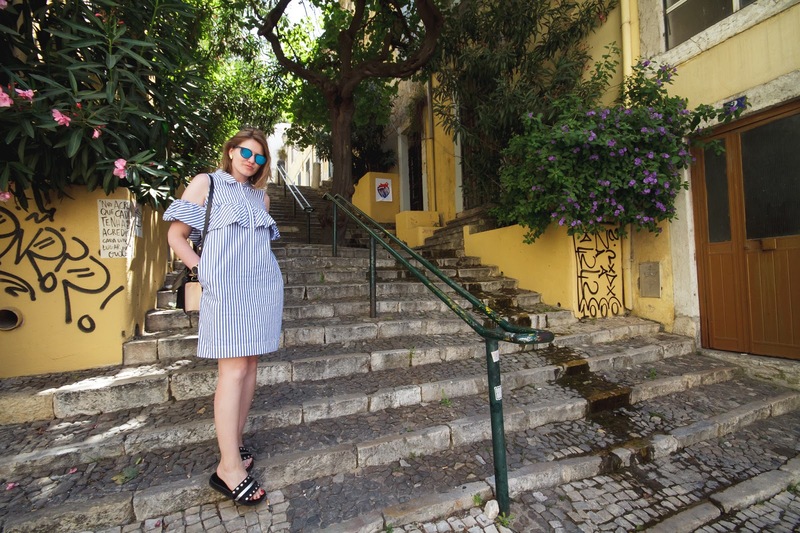 Getting anywhere in Lisbon is really part of the fun, especially if taking one of the old trams which are still the best way to reach the top of the steepest hills. I'm still surprised how well they go up the hill, we had a very nice experience. 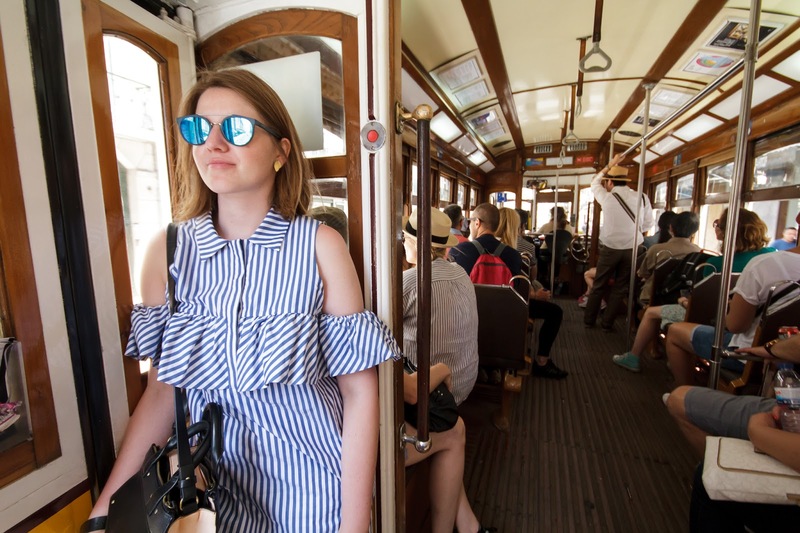 I recommend taking tram number 12, which is Lisbon’s third most popular tram route with tourists and a portion of this popularity is due to the tram sharing the same rails as the number 28 service. The number 28 tram is favourite among tourists as it transports visitors from central Baixa up through Alfama and to the castle but tram 12 is a more sensible choice for visitors to experience Lisbon’s trams as it significantly less busy and departs/terminates close to central Lisbon. Lisbon knows how to celebrate. Whether it’s a saint or a traditional food festival. Check and join this all year festive spirit, embrace the regional culture in the typical festivities or listen to famous musicians in festivals that attract people from all over the world. We went to the Guns 'N Roses concert, which was by the sea so we didn't only get to enjoy great music but the scenery was also amazing. I still can't believe how great of an experience that was. If you're a fan of good coffee you have to visit Fabrica Coffee Roasters. They have really good coffee and they buy their 100% Arabica straight from the producer’s farms in countries as Brazil, Colombia, Ethiopia, Kenya and Guatemala. Besides this, I was also in love with their walls! You seriously have to see them by yourself. This is not really a coffee place but you have to stop for the best Pastel de nata pastry. When the bell tolls are just baked and the whole crowd runs inside to get them while still fresh and warm then you know you are at the right place. Pastel de nata are egg tarts and each costs €1. You can also take them with you. They offer boxes with 2 or 4 pieces inside. Unfortunately, there are no chairs to sit but you can enjoy your egg tarts while walking on the streets. I think the original is from Pasteis de Belém but there is a long queue of Tourists so we rather got them from Manteigaria. From eggs to pancakes, even their granola is very tasty and don't get me started about their bread. They make really good bread. The decor is beautiful, furnished with natural materials and a lot of wood which makes it very warm and welcoming. The Mill is a cafe by day and wine bar at night. Their goal is to serve fresh and contemporary Portuguese food. On Saturdays and Sundays they also have brunches and that one I love so much; granolas, eggs and a lot of fruits plus very good coffee, I am a coffee addict and always try to find the best one. I highly recommend sitting by the window where you can observe the street. The place is small so it is good to get early or make a reservation. There are 24 stands from different restaurants (some are from very well known Portuguese chefs) all together under one roof and for thirsty there are 8 bars. You can try the very best steaks, hamburgers, the great sushi and the awesome desserts and wines from Lisbon. On the other hand, the market is a home to some of the city's best-known and longest-running market vendors of meat, fish, fruit and flowers. Even if you don't want to buy anything I would still recommend you to go there as you get an insight into their rich culture which is so captivating and vivid, very different from my own.